The Long Island and New England Hurricane of 1938, Hurricane Carol, Hurricane Donna, Hurricane Gloria, Hurricane Bob... These and a few others are among the better remembered tropical cyclones that have struck Long Island and southern New England since 1900 and left a lasting impression on many in the region. They are far from the only ones to have threatened the northeast; in fact the region is threatened by at least one of these tropical storms during most years. They range from weakening minimal tropical storms to the strong category 3 monster that devastated large swaths of the region on September 21, 1938. Some of them made direct hits on the region and some were near misses. Of the near misses, some of these still caused major damage for parts of the region. Many of the latter have been all but forgotten with the passage of time. Listed below are the dates and significant impacts of tropical storms and hurricanes that have affected the US east coast from the mid Atlantic states on northward since 1900. Included are both direct hits and near misses. In the accompanying pages are descriptions of each of these storms assembled from available documentation. The record of tropical cyclones in the Atlantic basin since 1900, although probably not complete for the early part of the 20th century, is still quite good given the lack of modern observing systems prior to World War II. Even before the advent of radar and satellite observing systems, weather data from ships at sea was plotted to identify and locate tropical cyclones. Many ships routinely sent reports via radio of observations including wind speed and direction, sea conditions and barometric pressure. By 1900, a network had been established where many of these reports were forwarded by telegraph and other means to offices of the United States Weather Bureau where forecasters could compile the data and make important inferences about the location, intensity and track of tropical cyclones. In many cases, timely warnings were able to be disseminated that saved lives and property. In some cases the data available was not sufficient to forecast the track of the storm and there were some surprises with tragic consequences. In addition to near real-time radio reports from ships at sea, many other ships recorded weather observations in manual logs that were later used to better trace the history of these tropical cyclones. Although it is likely that there were tropical cyclones that escaped detection during the first half of the 20th century, we nonetheless have a very good picture of many of the storms of each season going back that far and even before 1900. There currently exists an ongoing effort, the "Atlantic Hurricane Re-Analysis Project", to extend and revise the National Hurricane Center's North Atlantic hurricane database (aka HURDAT) for tropical cyclones going back as far as 1851 . Most of the data used to assemble these pages comes from old issues of the Monthly Weather Review (MWR), which has been published continuously since 1870, at first by the US Army Signal Corps, then by the US Weather Bureau from 1891 until 1973 and most recently by the American Meteorological Society. The MWR issues document the detection and tracking of the storms of the day, warnings issued, and some of the impacts of the storms. All of the MWR issues reviewed are available online. Links to these and other good sources of related information are provided in the links page. Tracking maps came from the NHC/TPC Archives and some additional information was extracted from old climate reports, cooperative weather observer records, and daily weather maps. This list does not include every storm of tropical origin that has eventually affected the weather in the northeast. Many more times the extratropical remains of storms that lost their tropical characteristics and strength far from the region have brought substantial rains, and in some cases winds. In some cases the rains were welcome news and in others they exacerbated flooding problems. Even in years where tropical systems do not threaten the northeast, the moisture brought north by the remains of dissipated tropical cyclones accounts for an important share of late summer rainfall in the region. In 2004 only Charley approached Long Island as a minimal tropical storm (if that), and produced little in the way of wind, but some much needed heavy rain for the parched eastern half of Long Island. More significantly, the remnants of 5 other hurricanes that had struck the southern United States also produced heavy rainfall on Long Island during August and September. Collectively, these 6 rain events that were associated with tropical systems accounted for most of the rainfall over the eastern half of Long Island for the entire summer of 2004. While 2004 was an exceptional year for such systems, over the long term they have been a very important contributor to summer rainfall on Long Island. For more detailed information about any of the storms listed below, click the picture in the left column of the same line (the photo is a visible image of Hurricane Rita near its peak on September 21, 2005). Thus far the list has been extended through 1940. It will grow over time as more recent storms are added. 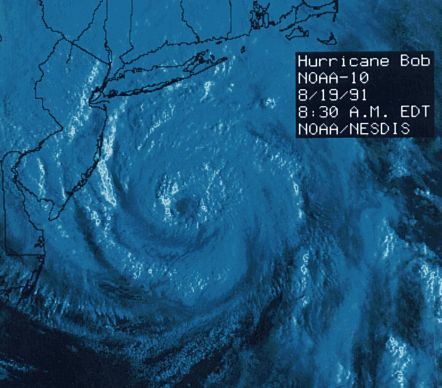 This storm was probably the first tropical cyclone to directly affect the northeast during the 20th century and may have been a hurricane at the time of landfall in southern New Jersey. The worst conditions and property damage occurred in New Jersey, but high winds and heavy rains also affected parts of New York and Connecticut. On September 14, 1904 a hurricane made landfall in northeastern South Carolina and moved very rapidly over the coastal plain, emerging near the mouth of the Chesapeake Bay 12 hours later. From there it moved along or just over the lower Delmarva Peninsula and skirted the southern New Jersey coast before landfalling again over Long Island and near the Connecticut/Rhode Island border less than 12 hours after emerging back over the ocean near Norfolk. A rare pre-season hurricane weakened to a tropical storm as it passed very near Cape Hatteras on May 29th, 1908. It then weakened further passing very close to Montauk Point and then inland over eastern New England as a minimal tropical storm. From a point near coastal New Hampshire it merged with an extratropical low as it bisected the state of Maine on its northward track. Based on ship reports, this storm is believed to have attained category 2 or 3 hurricane strength over the Atlantic. Strong northerly winds were observed along the coast on the 20th as far north as New York as the weakening storm tracked offshore. On the morning of July 21st, the cyclone, probably a strong tropical storm or possibly still a minimal hurricane approached southeastern New England and passed over Cape Cod. A tropical storm that passed to the east of Bermuda was deflected to the northwest by a large high pressure system situated to its north and northeast over the Atlantic Ocean. From there it tracked northwest all the way to the Massachusetts coast, crossing over Nantucket and Cape Cod overnight on the 18th and almost directly over Boston during the morning before dissipating on the 19th of October. Ships north of the Bahamas reported hurricane force winds and barometric pressures around 28.70 inches (972 millibars) on August 24th. On August 24 a large trough of low pressure moved into much of the eastern US, turning the winds along the coast to the south and quickly turning the hurricane and accelerating it rapidly toward the north-northeast, passing very close to Cape Hatteras and then Nantucket. The Chesapeake-Potomac Hurricane of 1933 was considered one of the most severe storms to have occurred along the middle Atlantic coast. Many records that were set for tidal flooding still survive this day, still eclipsing the tide of Hurricane Isabel seventy years later. A category 3 hurricane passed just west of Cape Hatteras on the morning of September 16, 1933. From there it moved north-northeast back over the Atlantic passing southeast of Nantucket on the 17th. Severe damage occurred in eastern North Carolina and the Virginia Capes while areas to the north experienced less damage than in the hurricane that struck the previous month. On September 8, 1934 a tropical storm first reported over the eastern Bahamas passed over Long Island after brushing by Cape Hatteras on its journey north. The storm attained hurricane strength with the lowest pressure report received from a ship at sea being 28.56 inches (967 millibars). The New York City area was on the western side of the storm as it crossed Long Island, but still reported near hurricane force winds. This was a very large hurricane as evidenced by ship reports indicating an area of circulation with winds of around 25 knots or more a thousand miles wide. As it approached Cape Hatteras it began to recurve towards the North and accelerate. After paralleling the lower Delmarva, the hurricane turned more to the northeast and passed a little southeast of Nantucket. The Long Island Express, also known as the Great New England Hurricane of 1938, was at the time the costliest natural disaster ever experienced in the United States. It was also one of the deadliest, taking at least 600 lives on Long Island and in New England. This storm falls into the near miss category as it did threaten the east coast and cause some high winds at Nantucket and then passed very close to Eastport, Maine before dissipating over Canada. The hurricane remained offshore, passing very close to the 40/70 benchmark during the pre-dawn hours on September 2 and then less than 75 miles east of Nantucket Island.